As Lizzy closes in, Seth Brown is undeterred. Madeline wanted a stalker and now she has one. Nothing is going to stop him. He’s obsessed. Where does Obsessed rank among all the audiobooks you’ve listened to so far? This book was really good and would fall in the top half of my books as opposed to the bottom. I thought Kate Rudd did a fine job narrating. Although sometimes a little whiney, I can picture the character she is performing being the same. OMG the END! I will not say more. I think this was the best in the Lizzy Gardner series. Great plot, characters fleshed out, backgrounds filled in and a really twisted seriel killer who is OBSESSED. If you listened to the first 3 in the series and liked them, then there is no reason to even hesitate for a moment. This is certainly worth the $. Tried to get into this book but no luck. Dragged and was not believable. Too many characters that were BORING. 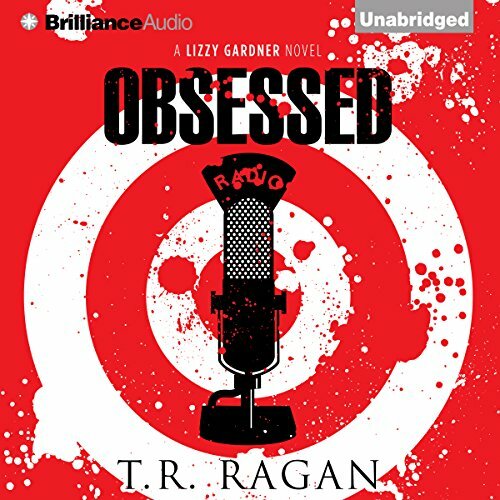 T. R. Ragen's Lizzy Gardner series keeps getting better. It would be difficult to imagine a more evil villain than the one in this book. Abducted, the first of the series, was a mild disappointment, but others are much better. Kate Rudd's narration is stellar. I'm Obsessed with this series! Radio personality psychiatrist, Madeline Blair's, ratings are slipping. In a desperate attempt to draw attention to her show, she has her audience believing that she is the target of a stalker. But one listener takes her seriously - he thinks he has to protect Maddy. When the listener finds out Maddy has been lying to her listeners, his focus changes from protecting to teaching her a lesson. He becomes obsessed in his relentless pursuit. Kate could narrate the dictionary and it would be entertaining. the book was OK but she has too many storylines going on at the same time that have nothing to do with each other makes an adhd very distracted. Ughh the ending is all I’m going to say. On to the next book! Definitely recommend. Lizzy Gardner is just an unbelievable character I had read another book of hers and anyone who has lived through that kind of trauma is not a warrior like the book makes her out to be... it is so fake and makes traumatized people look week for not getting over their trauma and being so STRONG like Lizzy is... it is a tragedy the way she presents herself.... it greatly bothers me.